We’ve sought out leaders (we call them “Ambassadors”) with a heart to come alongside you and encourage you in your calling to serve women well. These women have our DNA—hearts that beat for revival and biblical womanhood. We hope you’ll reach out to the Ambassador who lives nearest you. She would love to connect with you, lift up your arms, and help you face the daily grind of ministry! To find out more about the Revive Our Hearts Ambassador program, contact our office. Aren't we thankful the disciples asked that question (Luke 11:1)? Just because we're called a leader doesn't mean we don't need guidance when it comes to prayer. Many of us feel inadequate to direct a prayer gathering, yet deep down, we sense a stirring to pray more and sound a trumpet call for God's people to unite their voices to cry out to Him (Joel 1:14). Are you, like the disciples, asking, "Teach me"? With practice and a few simple tips, you'll discover that leading corporate prayer isn't nearly as intimidating as you once thought. What could be more thrilling than to link hearts and hands with believers to confidently enter the throne room where God's mercy and grace are waiting to be dispensed? For faith-building inspiration, sample the bold accounts of the early church's prayers. They never attended a prayer seminar, but they witnessed its amazing power (Acts 2:42–47; 4:29–33; 12:4–17; 13:1–3; 16:25–34)! First, let's linger on this stunning truth: Prayer is an invitation from a loving Father who longs for His children to know and walk with Him (Ps. 27: 7–8). Pastor and author Daniel Henderson explains that transformational prayer starts by seeking God's face (His intimate presence) before we seek His hand (His works on our behalf). Through abiding prayer like Jesus described in John 15, astounding things will happen. Our heart is shaped more like His heart, our stubborn will is relinquished for His kingdom plan, our lukewarm love for Jesus and His Church burns red hot. Our requests become the ones God answers because they originate from Him! And finally, closing in faith and agreement. Pray in sentences—not lengthy paragraphs. Self-monitor to avoid dominating the "airwaves." Pray audibly so others can hear and agree. Wait on the Lord and listen to His Spirit in times of silence. I promised to take dinner to the Jenkins tomorrow. Today's staff meeting was tense. I wonder what's going on? The doctor's office promised to call with test results by the end of the week. It's impossible to pray when our minds are focused on our own worlds—as important as our pressing issues may be. We need to ready ourselves for a fresh encounter with God who restores peace and rest to our souls. Sing or listen to a quiet worship song. Have a few moments of silence specifically asking God to renew our minds and captivate our thoughts. Read a Puritan prayer or short, meaningful devotion that's related to a chosen theme. Plan for a brief testimony related to prayer, or share a revival story from history. Seek the Lord's wisdom to select a specific Scripture passage. The verses can create a theme for the prayer gathering or simply provide the foundation. The Psalms are a good place to start because they prompt adoration and thanksgiving. Once you've selected the Scripture verses in advance, meditate on them and ask God to make them fresh in your heart. Introduce the passage by asking participants to turn in their Bibles to follow along as you read. When you demonstrate a reverence for the Holy Word, others will follow. Share a few devotional comments on why you chose the passage and what it's about. Be guarded against moving from facilitating prayer to Bible teaching. The Word of God speaks for itself. Read the selected passage intentionally so it can be internalized. Opening our hearts to God's truth demands a response. As we seek to be tender toward the Spirit's leading, we can't help but offer our praises and gratitude for who God is and for all He has done for us in Jesus Christ. Set an example of delighting in God's goodness before we begin to make requests. It's human nature to begin praying by making requests of God, but for now, ask the group to refrain from intercession. It's a hard habit to break, so don't be discouraged. Like any learned skill, practice is the key. Guide the group back if it wanders off track. Urge women to concentrate their prayers of adoration from the selected passage. Begin by offering a short praise or confession, and ask others to join praying in a random order. Responding to God's truth isn't limited to praise. It will at times include expressions of surrender, brokenness, confession, wailing, and singing. Lead with transparency allowing God's Word to penetrate your heart, too. "I love You Jesus, because _____." "God, You've rescued me from _____." Tailor the response portion to fit the Scripture you've chosen. Transition the group from worship to intercession using passages like Matthew 7:7, Romans 8:26–28, Hebrews 7:25, or 1 John 5:14–15. The aim of corporate prayer settings is to allow the Spirit to move freely to bring to mind how we should pray. When we keep our Bibles open and don't rush through the quiet moments, we're inviting Him to help our prayers be more kingdom-minded—as we pray for God's people, communities, churches, and for revival and spiritual awakening throughout our nation and the world. Listening to the Spirit's promptings, we will build upon each other's prayers, and often new themes will emerge. Depending on your group, you can divide the praying into segments, but it generally works just as well not to interrupt the flow of praying. As you remain in a spirit of prayer, you can gently steer the group in a particular direction as God gives you insight. The high point of every prayer meeting is to celebrate God's sovereignty, His perfect plan and purposes, and His answers to the cries of our heart. We rejoice with gratitude for the privilege of worshiping in His presence and delighting in the grace that is ours in Christ. Our hope and faith explode in the precious promises that steadfastly hold our future. We remind ourselves that Christ is triumphant, and His kingdom will never end! Sing a hymn or the doxology. Recite the Lord's Prayer in unison. Have a responsive Scripture reading where each person repeats an affirmation after each verse such as "Jesus is Lord," "His kingdom is forever," "Worthy is the Lamb," "Come, Lord Jesus," or "His steadfast love endures forever." Close by reading Scriptures like Daniel 7:13–14, Psalm 61, 136; Ephesians 6:10–18; Hebrews 6:13–20, Revelation 21:1–7. At the beginning or the end of a prayer meeting, allow a short time for women to engage in informal conversation, to share answered prayer, and to connect their hearts. 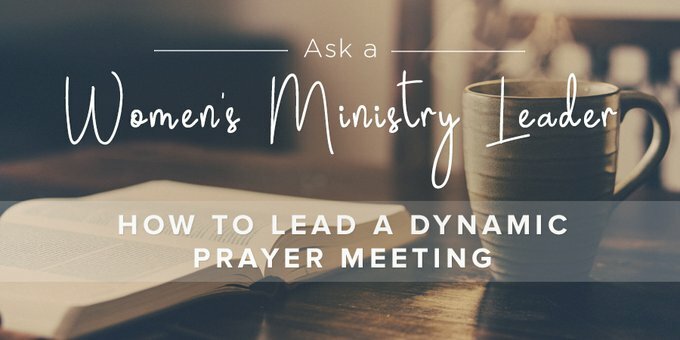 A leader's role is to help women connect the dots to understand how their daily life is being impacted by their prayers. Building relationship among the group members helps us lay aside our differences and experience deeper oneness in prayer. I'm convinced . . . If we fully comprehended the absolute necessity of both personal and corporate prayer to bring about the change we desperately need, our prayer rhythms would become radically different. Just as the prophet Joel blew the trumpet in Zion thousands of years ago, it's time for us to sound the alarm and implore God's people to return to Him in humble, repentant prayer (Joel 1:14; 2:1, 5–16). There is no time to waste. To take the next step in leading corporate prayer, use and adapt the five-week Praying Together Group Guide from Revive Our Hearts.